This lovely 4 bedroom villa for 8 people, has a private terrace around the pool, an outdoor dining area, a large fully equipped kitchen and a beautiful open lounge/living area including an open fireplace. The villa has a luxury gas barbeque, but also a barbeque area including a charcoal grill, free wi-fi and a TV with streaming services. The large roof terrace offers fantastic views day and night. 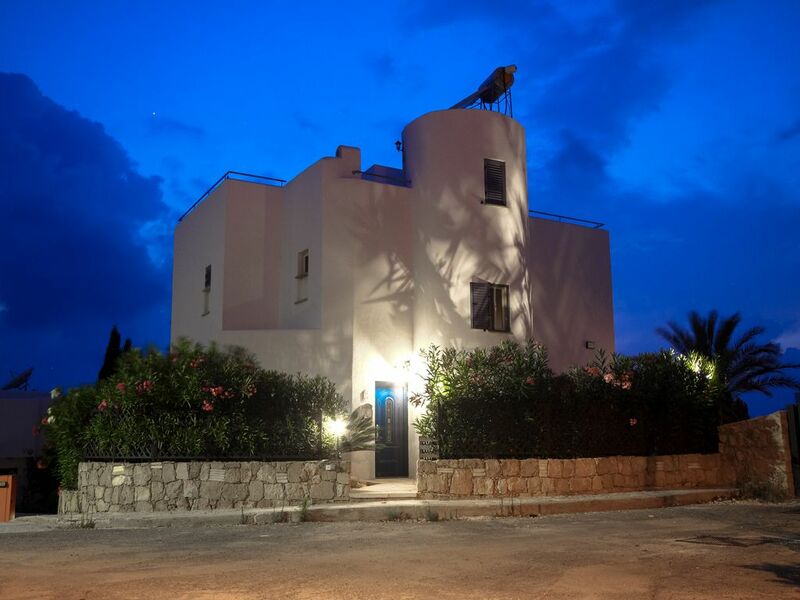 The villa is located at Apollo Beach, a peaceful area just north of Paphos, not far from Coral Bay. The nearest beach is approximately 150m away. A hotell complex with pools, sun beds, restaurants and bars is located within a couple of minutes walk. When we first went up to the roof terrace and saw the fantastic view with the shipwreck - that was when we fell in love with the place. The villa has a central heating system for the winter season, but is off cause fully equipped with a modern air condition system used both for cooling and heating: The terrace and balcony give a fantastic view of the Mediterranean. Outside: A total of 8 sun loungers are available beside the pool or at the roof terrace. 2 spare beds are available The villa is professionally cleaned before arrival and after departure. Linens and towels, incl. pool towels, are provided on a weekly basis. Additional cleaning and laundry change can be arranged during the stay. Children are welcome. A crib and a changing table is available. The child highchair and the stair gates available for the stairs will help if you have small children. The washing room with a washer, a highly effective dryer and iron equipment, make washing easy. We've just returned this morning from a 10 night stay at the Villa and we've had a fantastic time. Totally recommend and would love to return. Spotlessly clean including the pool which was cleaned a number of times during our stay. Air conditioning throughout which works really well. Villa has everything a home needs including quality white items. The decor was fantastic and just as seen in the photos on the website. If travelling with small children / babies this is ideal - baby gates throughout and imaculate baby equipment, if travelling with teenagers wifi and fantastic TV channels. Roof top views of the sun setting on an evening and the sound of the sea as you wake up are idyllic. Yvonne and Gary who manage the villa went out of their way to help before and during our stay. All the comments in the visitors book are exactly the same as ours - not a single negative comment. Thank you for a fantastic holiday. Thank you for your kind words about the property, Mr Marshall. We are very happy that you enjoyed your stay, and are looking forward to your next booking.